Many commercial cleaning products are not safe to use around cats. The chemicals in these products can be extremely toxic, and even deadly. Cats are especially susceptible since they groom themselves by licking and as a result ingest anything that comes in contact with their feet or fur. Additionally, the chemicals in and fumes resulting from cleaning products can cause allergic reactions in cats (and humans, for that matter). Many chemical cleaning products pollute the air inside your home by off-gassing toxic fumes, or they contain antibacterial substances that are not only unnecessary, but can actually contribute to bacteria becoming more resistant to killing agents. Thankfully, there are alternatives to these chemical products that are not only safer for your cats, but also gentler to the planet. And they’re inexpensive! 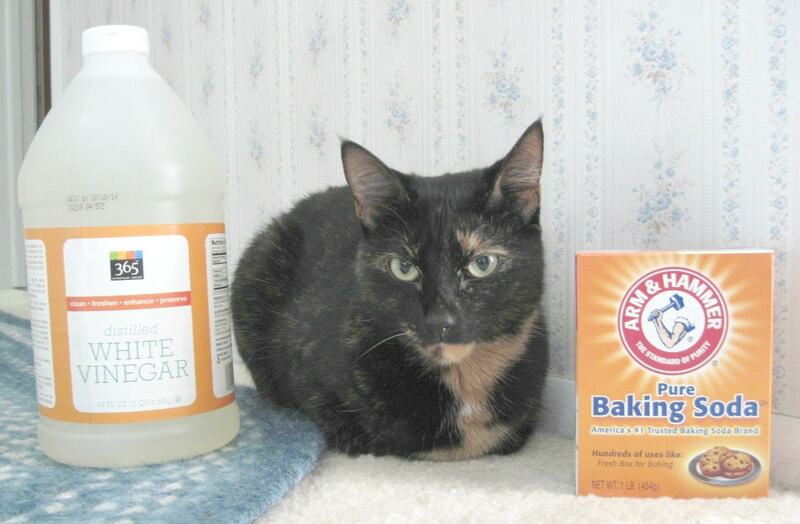 Allegra was kind enough to pose with two of my go to cleaning products for this post. You’d be surprised what you can do with vinegar, baking soda, olive oil and lemon juice. Use a vinegar and warm water solution on wood, ceramic tile, linoleum or vinyl flooring. Since cats are so low to the ground, using a non-toxic cleaner on floors is especially important. If you’re using a carpet steam cleaner, use a water and vinegar solution (one part water to one part vinegar) in the reservoir. Dust surfaces in bathrooms and kitchens with baking soda and wipe with a moist cloth or sponge. Vinegar and warm water work well, too. If you need to get rid of mildew or grease stains, spray them with lemon juice, wait a few minutes, and then use a stiff brush to scrub away the residue. Have you ever read the warning label on a bottle of drain cleaner? It’s enough to make you afraid to even open the bottle. Use baking soda and vinegar instead. Pour a few tablespoons of baking soda down the drain, and follow with a cup of vinegar. The foaming action of the two products will work away at the clog. Rinse with hot water. Olive oil, or olive oil and lemon juice (two parts olive oil, one part lemon juice) makes a wonerful furniture polish. I do not recommend using the self-cleaning feature on ovens. I find myself reacting to the fumes released during the cleaning process, so I can only imagine how more sensitive cat noses will react. Use a paste of baking soda and water instead: coat the inside of your oven, let it sit overnight, and then scrub away the grime the next day. The chemicals contained in dryer sheets (as well as fabric softeners and laundry detergents) get absorbed by your skin as well as your cats’ skin. Chemicals contained in these products are known carcinogens and neurotoxins. Sometimes it’s inevitable to expose our cats to toxic fumes (although I have been known to nix remodeling and painting projects because of the impact they might have on my cats). It goes without saying that the area that is being painted should be well-ventilated. If you don’t have an ionic air purifier, set small bowls of vinegar around the room, and change daily. The vinegar will absorb the smell. Leave these bowls out until all paint odor is gone. While these safe and inexpensive cleaning products may require a little more elbow grease than their chemical cousins, isn’t the peace of mind of knowing that they’re safer for your cats worth the extra effort? Do you have a natural cleaning product or a green cleaning trick you like? Please share in a comment! Hi Ingrid – thanks for the helpful article. I have an old cat who has decided to use my office as a litter box, when she doesn’t feel like going in the kitchen where the actual box is (which seems to be quite often). Dealing with the smell is a disaster and I’ve tried at least four products so far. Everyone says diluted orange oil is a great cleaner and also will keep the cat away from the area, but is this safe, even heavily diluted? I really need her to not pee in that area but obviously don’t want to use something that would cause problems. I see almost every essential oil listed except Jasmine. Can I use Jasmine essential oil in my air purifier. This purifier is about the size of a large yellow onion and I only use 5 drops in it. I would say it holds one cup of water. It this safe for my cats or not? I don’t recommend any essential oils around cats. It’s a controversial topic, and some say they’re safe, but I’m not convinced. This article explains: http://www.naturalcatcareblog.com/2012/05/cats-and-essential-oils-perfectly-safe-now-exploring-the-controversy/ The article is a few years old, but I haven’t seen anything since that convinces me that they’re safe. Thank you Ingrid for the info and the article. I am with you, I am not convinced that any essential oil is ok to use in the diffuser ever! It will only diffuse water from not on the keep pet hair and dander down. Lemons are toxic to cats (according to ASPCA) so should we be using lemon juice if diluted? I’d rather be safe and not. While I think it’s unlikely that cats would actually ingest lemon juice, I would err on the side of caution. If you do use it, make sure you rinse with water afterwards. Have you any thought on Dr. Bronner’s Sal Suds? I’m not familiar with that product. Essential oils are not safe around cats. It’s a controversial topic and some manufacturers say their oils are safe, but I prefer to err on the side of caution. Thanks for the info on the dryer sheets and the fabric softeners. Can you use cleansers around cats to clean sinks, tubs and tiles along the baseboards? Is it ok for your cat if you dilute your oven cleaner with water? I don’t recommend any cleaners containing chemicals – use the products recommended in this article instead. Chemicals in and of themselves are not evil and each item you’ve presented IS a chemical. It’s OK to say you want less harsh products without vilifying chemicals. Even the products you listed have potential negatives that should be considered. For example, if you don’t wash your hands thoroughly after using lemon juice and then go outside, you can get phytophotodermatitis which is a very nasty chemical reaction. It can result in second-degree burns in very extreme cases. I’m not saying your post is bad (it’s actually quite useful and I appreciate it), I just get a little upset when people suggest that chemicals, in general, are bad and should be avoided. Without chemicals and chemistry, we’d be stuck in the dark ages of science and medicine. I have Barbararead citris andmany other essentialoils can kill your kitty. Please do your homework..
Vinegar has antibacterial properties, so it should be okay, but on carpet, it may be difficult to truly keep it clean. If she drags her chicken necks to the same carpeted area all the time, you may want to consider putting a smaller rug there that can easily removed and thrown into the washer periodically. I use white vinegar for fabric softener. Works great. And I keep bathroom drains cleaning and flowing by pouring the hot water & vinegar combo down them that I get from cleaning my coffee pot and water kettle. Haven’t had any problems with the drains running slow since I started doing that. Hello Ingrid and all you beautiful cat lovers <3 I use hydrogen peroxide to clean out my cats litters. I use wheat cat litter and in the places in their litter where they have urinated, I take my spray bottle of hydrogen peroxide and spray and use paper towels to wipe them down. I feel this is safe unless someone has an idea that this is not safe. I then take a spray bottle of water and flower remedies that make happiness and spray the litters to make my cats happy to use their litter boxes. I wouldn’t use hydrogen peroxide undiluted to clean. Hot soapy water is usually enough to get the litter box really clean. As long as the flower remedies you use to spray the litter are unscented, I don’t see a problem with that. A quick word about the ionic air purifiers you mention in the section in paint fumes; cats with asthma should not be exposed to these. The HEPA filters are safe for them however. I have a cat with very sensitive skin and stomach. I live in the tropics,and for the past 2 weeks I’m having an ant problem in my house. Any suggestion of a green way to get rid of them without exposing my cat to any pesticides? Kind regards. I’ve used this product with some success, Teresa: http://amzn.to/N9jLCQ Terro Ant Baits are also supposed to be safe around pets: http://amzn.to/1huHv2a – I’ve used them, but I make sure they’re in enclosed spaces my cats can’t get to, such as the inside of kitchen cabinets. I don’t trust the safety claim enough to leave them out in the open. Sprinkling used coffee grounds around the perimeter of your house, especially where you know ants are coming in and out, greatly helps with ants. For whatever reason, the ants don’t like crossing the coffee barrier. I put a thick line of paprika outside across my doorways, which ants do not like- it works marvelously! As long as you put it very close to the doorway, it does not get tracked into the house. You could also try cayenne pepiper. I was under the impression that all things citric (lemon, orange etc) was the best way to anger kitty. That is to keep kitty out of a room or area was to use anything citrus scented because they don’t like the smell. Yet the article mentions lemon juice in various places for cleaning. I too feed raw and use vinegar water blend on the countertops, floor and tabletops to clean up after the messy eaters. Dishwasher takes care of the rest. Lots of good information. Didn’t see any mention of chlorine bleach – is it bad? Also, suggestions for removing cat pee odor from various items such as rugs, clothing, etc. Diluted bleach is okay to use around cats as long as you don’t let them walk on the surfaces while they’re still wet. If it’s not diluted out enough, it can cause burns on their paw pads, and I wouldn’t want cats to ingest even a diluted bleach solution if they lick their paws. The absolute best thing I’ve found to remove urine odors is the CritterZone air purifier (see link in the sidebar). Put it upside down on the soiled area for half an hour to an hour, and it eliminates virtually all traces of odor. Thanks for this. I did NOT know about the dryer sheets so that’s very good to know. I always close the door when I have to unclog drains (which in this building is once a month). I’m going to try the baking soda and vinegar next time. Dummy me never even though of it. Try Earthworm to unclog drains. It is eco friendly. I don’t know about cats and vodka but I am sure it is healthier for them then fabreeze. When I was in theatre school, a costume told us that she used cheap potato vodka with water and a few drops of tea tree oil, lavender and another essential oil on fabrics to reduce smells on items that are not machine washable. I am sure it works without the essentials oils in it. I think it was one part vodka to one pair water. When my friend had a baby who was crawling, she used hot water and a microfibres mop to clean her floors. I used to use them on my counters and best job ever cleaning ever! Also baking soda and vinegar do a great job of mining chrome shiny. We used to use it in pool that worked in. We also used vinegar to clean windows too with coffee filters. I don’t know about the vodka, Elizabeth, 🙂 but be careful with essential oils. They can be toxic to cats. I love the idea of using microfiber cloths and hot water – I will definitely try that! A lot of really good info here. We have a steam cleaner with various attachments that will clean various surfaces, we do use klorox wipes for convenience to clean up messes like a hair ball or if a cat pukes on the hard floor which doesn’t happen very often, but it wouldn’t be that much harder to just use a vinigar water mix with a rag or paper towel I suppose. I’m really coming to hate it when people use a ton of chemicals and crap to clean. They do it down where I work and when you are in there after they’re done the smell of the klorox and lisol or whatever they’re using about knocks you over. I’m finding I’ve developed this dry cough over the past six months or a year that I can’t seem to get rid of that is worse when I am around the stuff. I can’t stand the smell of strong chemical cleaners, either, Tom, although I don’t have the kind of reaction to them that you do. That’s a bit worrisome about your cough! Great article! Do you recommend using vinegar and baking soda to clean litter boxes? You can definitely use baking soda to scrub the boxes. Vinegar is fine to use, but I’d make sure to rinse really well to get rid of any lingering vinegar odor. Growing up in Florida, we used cheap, non-branded Coke to dissolve the rust on our outdoor faucets, so I occasionally use it to quickly dissolve nasty cat messes if I don’t have the time to scrub (rinsing afterwards of course so I don’t have a clean box with sticky residue). Also, for plastic litter boxes that get etched and stained, fill it up with plain white vinegar and leave it over night. Next day, the box looks like new again. Vinegar is amazing stuff, but never underestimate cheap soda, either. An alternative for dryer sheets is to use white vinegar in the wash. Really makes a difference in softer towels, etc. Also, make sure residue of baking soda, vinegar, etc. is thoroughly removed from the floor as accumulation can be harmful to the cat. Great info!! I already do all those things for the safety of my cats & dogs & myself. Awesome Post! Thanks for this important info! Lots of good info, Ingrid! Thank you. I’m slowly switching everything in my house over to more natural, less toxic, products. Shared to CatCentric.org’s networking sites. Between this and all the articles I’ve read recently about chemical damage from household products (like the University of Colorado School of Medicine and the University of California, Davis study on triclosan, a anti-bacterial chemical that’s nearly ubiquitous in our households, but has now been determined to affect muscles at the cellular level! ), I think it’s time I added a “Cat-friendly Cleaning Products” page to the site! Let me know when you hvae that page up on your site, Tracy, and I’ll include the link in this post. Wow, it’s rather disturbing that we’ve had this information for so long and yet anti-bacterial soaps are still so very widely used. Between raw-feeding and daily living, I wash my hands at last five or six times a day with this stuff! Ingrid, thank you so much for posting this! I’m printing it out to keep in my kitchen. I’d already switched to using a steam cleaner on my hard floor surfaces, but I hadn’t really thought about the other things. Though I do use “green” products as much as possible, these are much better for all of us, I’m sure! Amy, I use some green products, too, but baking soda and vinegar are probably even safer – and definitely less expensive! Ingrid, essential oils used on a cloth or ball are completely safe. The heat of the dryer evaporates all volatile compounds. All that’s left is a hint of scent. I tear old sheets into 12 inch squares and add 6-8 drops of lavender. My hubby loves doing laundry and hangs it outdoors in the garden during warm weather. I love air dried laundry, Layla! In the “olden days,” when I lived in Germany, before people had dryers, that’s how we dried all our laundry. And boy, are you lucky to have a husband who loves doing laundry! I have a slightly related question. I am switching my kitty over to a raw meat diet. I don’t cook meat myself so I’m not sure how best to clean the utensils and plates, or the sink and the countertop. Will vinegar do the job? Anything else I need to know to keep unwanted bacterial populations down? I feed my girl raw too=) It’s really no biggie to clean up! Straight white vinegar does a great job disinfecting. I use it to clean my sink, utensils, and anything kitty food touches. Just remember to wash your hands after handling the food and you should be good to go. I use hot soapy water to clean bowls and utensils, and a vinegar/water mixture on countertops. Whenever the dishwasher is ready to go, I throw the bowls and utensils in, too. I’m lazy. So I just fill a spray bottle with white vinegar to clean the counters. The vinegar smell goes away pretty fast. I clean the counter 3 times a day because my cats are allowed to be wherever they want, except the stove. No sense in making a kitty unhappy. And everybody should clean their counters before making a meal anyway. My kind of cleaning! That’s what I do, except I use a half water half vinegar dilution. Anjali, thanks for the info on the paint! I will ask my landlord next time they paint my apt. Thanks for this great post. With five cats in the house, I have to vacuum every two days. I had all the carpet in the house removed and replaced with nontoxic Marmoleum flooring (the original linseed oil-based linoleum), hardwood and tile. We have washable rugs, so when they get soiled by a hairball or something, I just throw them in the wash. I use only water to clean the floors. I repainted the interior walls with low VOC paint (low or free of Volatile Organic Compounds). There are several brands of low toxicity or nontoxic paints on the market. We used Benjamin Moore’s Eco Spec line of paints, which required only one interior coat and had low VOCs, although there was a bit of an odor – but much less than regular paint. We also had a proper heating and cooling duct system installed through the attic, with a 2 foot by 2 foot intake filter and vent in the hall ceiling, and an energy efficient heat pump installed just outside the garage with an air handler and furnace in the attic as backup. The air in the house is now constantly filtered and much cleaner than it used to be. I love what you’ve done with your house, Anjali! According to the ASPCA, jojoba oil is toxic to cats. 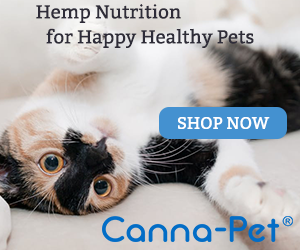 I couldn’t find any information on hemp oil. If you want to be 100% safe, I’d follow use with a rinse of water. Wow, had no idea about jojoba… Thanks a mil, Ingrid! I love using lemon water to clean my apt. My floors are mostly wood, and lino and tiles in the kitchen and bathroom. I first used it for fleas. Leaves a wonderful scent. Easy to make- recipes are online. No essential oil. Can add herbs to make like a tea, tho. One question, I use Dr Bronner’s unscented for kitchen counters. Is it safe? I love essential oils for my soaps and stuff, however, am switching over to hydrosols instead. I took a quick look at the Dr. Bronner’s website, Akiko. It looks like the products contain essential oils, so I would not use them around cats (see my response to OldGreyMare above). I’ve been doing this for many years already, it’s healthier for me, my cats, the planet and it’s so much cheaper! Also I have allergies so it helps me that way too. Dryer sheets are the worst for me so I put vinegar in the rinse water to help soften the clothes and take out some of the soap residue. I also make my own laundry detergent. I hang the clothes outside as much as possible , Oscar likes the smell of the fresh outdoors. Kelly, you make a great point about allergies. Whether it’s our own or our pets’ allergies, this kind of cleaning can definitely help. Thanks for the suggestion of adding vinegar to the rinse water! I LOVE green cleaning! Like you said, it does take a little more elbow grease, but it’s totally worth it to be kinder to our cats, ourselves, and the planet. I use a mixture of 1 c distilled water, 1/2 c vinegar, 1/2 tsp liquid dish soap, and 1/8 tsp rosemary essential oil for my all purpose cleaner. It does a great job disinfecting surfaces and smells great. Hubby was complaining about the vinegar smell when I used just vinegar and water, so this is a nice alternative. I do realize that essential oils are potentially harmful to cats if they get enough of a build up in their systems; Misty is not allowed anywhere near the areas I’ve just cleaned until it’s dried. I also use a very small amount to minimize risk. This one isn’t household/kitty related, but for those of you ladies who still get to enjoy that lovely time of the month, do yourself a favor and research the DivaCup 😉 It’s cheaper in the long run, easier to deal with, and far more environmentally friendly. Thanks for the alernative to dryer sheets, Melanie. I haven’t used dryer sheets in years and haven’t missed them, but it’s nice to know there’s a non-toxic option for people who want to use something. I do not advise the use of any essential oils around cats. Even though I’m seeing quite a few articles lately touting the safety of essential oils with cats, the information these sources present does not convince me to change my position. Dryer sheets??? OMG! I never new that….SUPER IMPORTANT POST……..thank you! Share Number 3!!! Caren, make sure you take a look at Melanie’s (NewGrayMare) suggestion for an alternative to dryer sheets below – and thank you for sharing! Thank you indeed. Will share it too! Thank you for this important reminder to be extra safe. I will share too. Thanks for sharing, Gracey! The more kitties stay safe, the better!